ABOUT • • • THE BOOK Freedom at Midnight (1975) is a non-fiction book by Larry Collins and Dominique Lapierre. 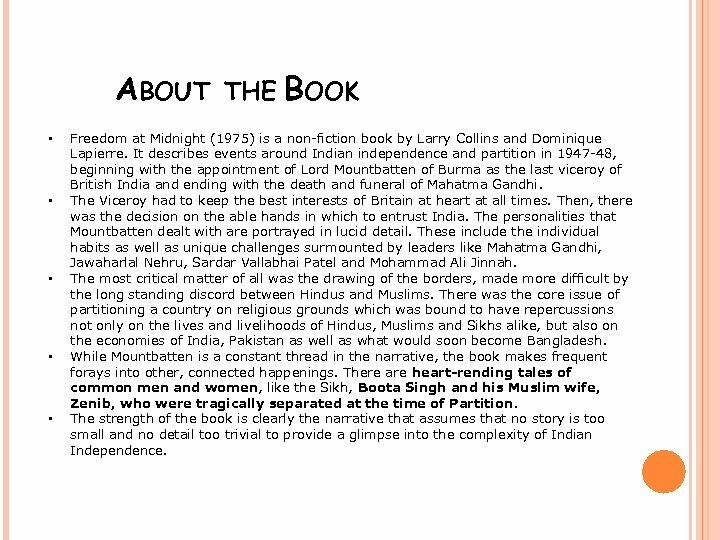 It describes events around Indian independence and partition in 1947 -48, beginning with the appointment of Lord Mountbatten of Burma as the last viceroy of British India and ending with the death and funeral of Mahatma Gandhi. The Viceroy had to keep the best interests of Britain at heart at all times. Then, there was the decision on the able hands in which to entrust India. The personalities that Mountbatten dealt with are portrayed in lucid detail. These include the individual habits as well as unique challenges surmounted by leaders like Mahatma Gandhi, Jawaharlal Nehru, Sardar Vallabhai Patel and Mohammad Ali Jinnah. The most critical matter of all was the drawing of the borders, made more difficult by the long standing discord between Hindus and Muslims. There was the core issue of partitioning a country on religious grounds which was bound to have repercussions not only on the lives and livelihoods of Hindus, Muslims and Sikhs alike, but also on the economies of India, Pakistan as well as what would soon become Bangladesh. While Mountbatten is a constant thread in the narrative, the book makes frequent forays into other, connected happenings. There are heart-rending tales of common men and women, like the Sikh, Boota Singh and his Muslim wife, Zenib, who were tragically separated at the time of Partition. The strength of the book is clearly the narrative that assumes that no story is too small and no detail too trivial to provide a glimpse into the complexity of Indian Independence. 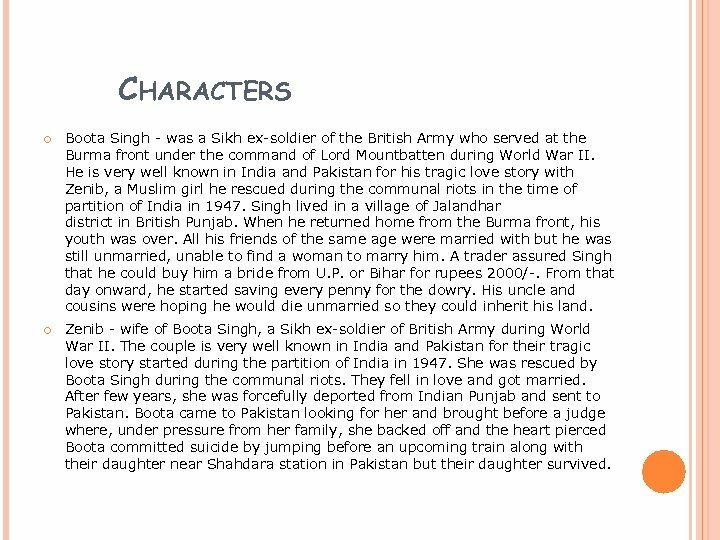 CHARACTERS Boota Singh - was a Sikh ex-soldier of the British Army who served at the Burma front under the command of Lord Mountbatten during World War II. He is very well known in India and Pakistan for his tragic love story with Zenib, a Muslim girl he rescued during the communal riots in the time of partition of India in 1947. Singh lived in a village of Jalandhar district in British Punjab. When he returned home from the Burma front, his youth was over. All his friends of the same age were married with but he was still unmarried, unable to find a woman to marry him. A trader assured Singh that he could buy him a bride from U. P. or Bihar for rupees 2000/-. From that day onward, he started saving every penny for the dowry. His uncle and cousins were hoping he would die unmarried so they could inherit his land. Zenib - wife of Boota Singh, a Sikh ex-soldier of British Army during World War II. The couple is very well known in India and Pakistan for their tragic love story started during the partition of India in 1947. She was rescued by Boota Singh during the communal riots. They fell in love and got married. After few years, she was forcefully deported from Indian Punjab and sent to Pakistan. Boota came to Pakistan looking for her and brought before a judge where, under pressure from her family, she backed off and the heart pierced Boota committed suicide by jumping before an upcoming train along with their daughter near Shahdara station in Pakistan but their daughter survived. 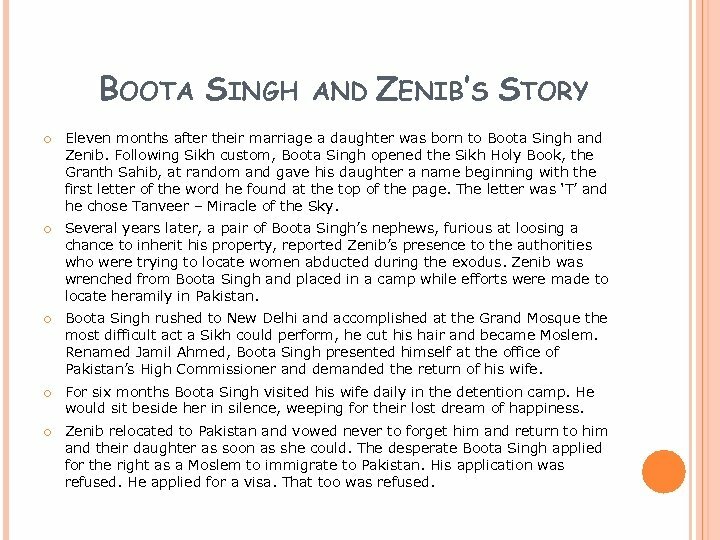 BOOTA SINGH AND ZENIB’S STORY Eleven months after their marriage a daughter was born to Boota Singh and Zenib. Following Sikh custom, Boota Singh opened the Sikh Holy Book, the Granth Sahib, at random and gave his daughter a name beginning with the first letter of the word he found at the top of the page. The letter was ‘T’ and he chose Tanveer – Miracle of the Sky. Several years later, a pair of Boota Singh’s nephews, furious at loosing a chance to inherit his property, reported Zenib’s presence to the authorities who were trying to locate women abducted during the exodus. Zenib was wrenched from Boota Singh and placed in a camp while efforts were made to locate heramily in Pakistan. Boota Singh rushed to New Delhi and accomplished at the Grand Mosque the most difficult act a Sikh could perform, he cut his hair and became Moslem. Renamed Jamil Ahmed, Boota Singh presented himself at the office of Pakistan’s High Commissioner and demanded the return of his wife. For six months Boota Singh visited his wife daily in the detention camp. He would sit beside her in silence, weeping for their lost dream of happiness. Zenib relocated to Pakistan and vowed never to forget him and return to him and their daughter as soon as she could. The desperate Boota Singh applied for the right as a Moslem to immigrate to Pakistan. His application was refused. He applied for a visa. That too was refused. o o o o Finally, taking with him his daughter, renamed Sultana, he crossed the border illegally. Leaving the girl in Lahore, he made his way to the village where Zenib’s family had settled. There he received a cruel shock. His wife had been remarried to her cousin. 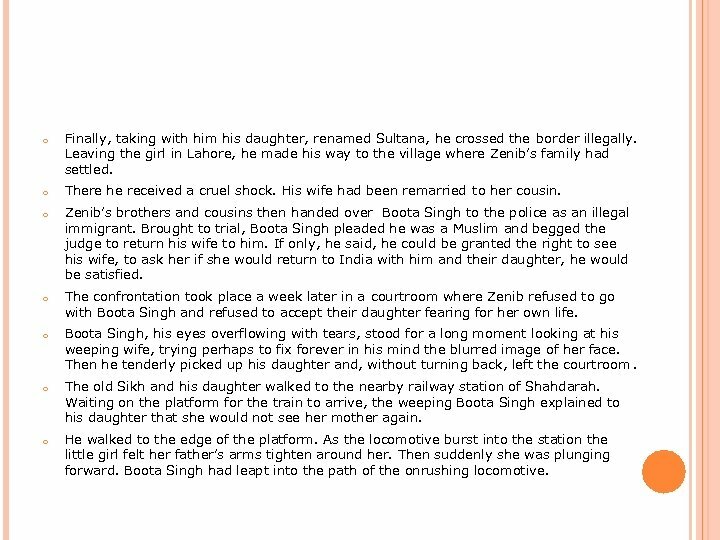 Zenib’s brothers and cousins then handed over Boota Singh to the police as an illegal immigrant. Brought to trial, Boota Singh pleaded he was a Muslim and begged the judge to return his wife to him. If only, he said, he could be granted the right to see his wife, to ask her if she would return to India with him and their daughter, he would be satisfied. The confrontation took place a week later in a courtroom where Zenib refused to go with Boota Singh and refused to accept their daughter fearing for her own life. Boota Singh, his eyes overflowing with tears, stood for a long moment looking at his weeping wife, trying perhaps to fix forever in his mind the blurred image of her face. Then he tenderly picked up his daughter and, without turning back, left the courtroom. The old Sikh and his daughter walked to the nearby railway station of Shahdarah. Waiting on the platform for the train to arrive, the weeping Boota Singh explained to his daughter that she would not see her mother again. He walked to the edge of the platform. As the locomotive burst into the station the little girl felt her father’s arms tighten around her. Then suddenly she was plunging forward. Boota Singh had leapt into the path of the onrushing locomotive. Boota Singh was killed instantly, but by a miracle his daughter survived unscathed. On the old Sikh’s mutilated corpse, the police found a bloodsoaked farewell note to the young wife who had rejected him. 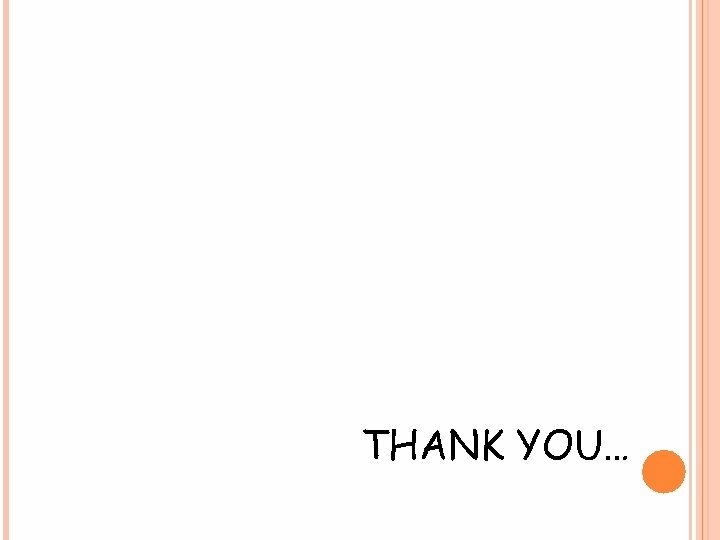 The note mentioned his last wish to be buried in Zenib’s town and that Zenib visit his grave to put a flower on it. Boota Singh’s suicide stirred a wave of emotion in Pakistan and his funeral became an event of national importance. 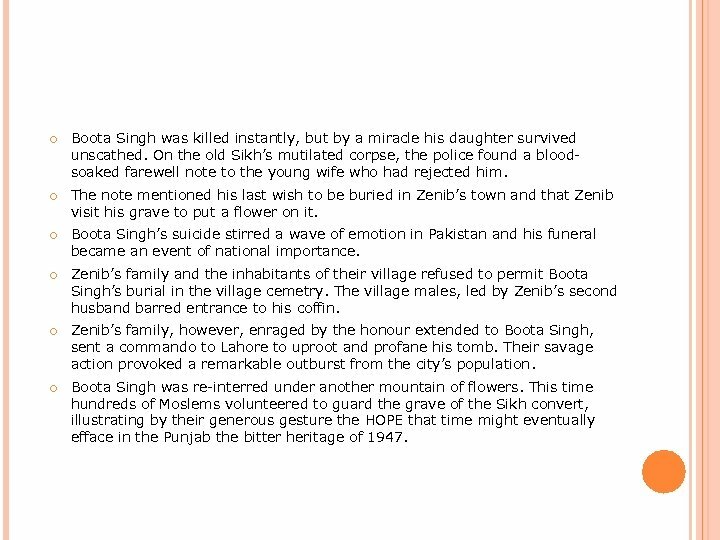 Zenib’s family and the inhabitants of their village refused to permit Boota Singh’s burial in the village cemetry. The village males, led by Zenib’s second husband barred entrance to his coffin. Zenib’s family, however, enraged by the honour extended to Boota Singh, sent a commando to Lahore to uproot and profane his tomb. Their savage action provoked a remarkable outburst from the city’s population. Boota Singh was re-interred under another mountain of flowers. This time hundreds of Moslems volunteered to guard the grave of the Sikh convert, illustrating by their generous gesture the HOPE that time might eventually efface in the Punjab the bitter heritage of 1947. POPULAR ADAPTATION In 1999, Manoj Punj directed a Punjabi feature film, Shaheed-e-Mohabbat Boota Singh, entirely based on the life story of Boota Singh. The movie stars Gurdas Maan as Boota Singh and Divya Dutta as Zenib. It was an international hit and won the National Film Award for Best Feature Film in Punjabi at the 46 th National Film Awards and was also screened at many national and international film festivals including the 1999 Vancouver International Film Festival and International Film Festival of India. Ishrat Rahmani wrote a novel on the love story, titled Muhabbat. 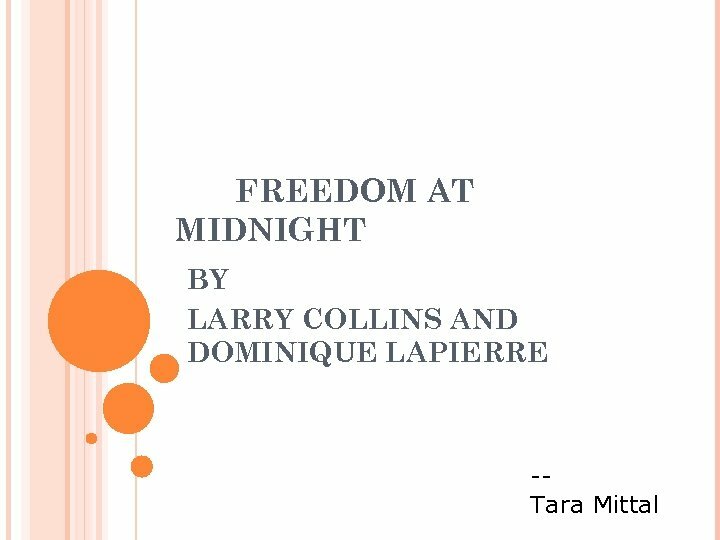 The story is also have some details in an English book, Freedom at Midnight by Larry Collins and Dominique Lapierre and also influenced a 2007 Hollywood film, Partition, written by Patrica Finn and Vic Sarin, starring Jimi Mistry and Kristin Kreuk in lead roles. London Museums. British Museum. British Museum.